Temporary Crisis or Paradigm Shift? 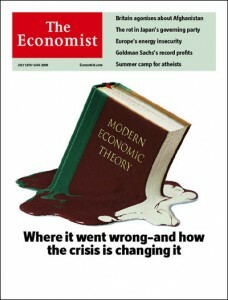 What’s wrong with economic theory asked The Economist in July 2009. Since then a lot of ink has been spilled on this issue. The most stimulating discussion — in my opinion — is Colander, Föllmer, Haas, Goldberg, Juselius, Kirman, Lux and Sloth who have written in more detail about the failure of the economic profession in terms of a misallocation of research efforts and the failure to communicate the limitations of the standard macro-models. Their paper is available at IDEAS. In the UK her majesty the Queen asked how economists could not see the crisis coming and reactions to the question came from Geoffrey Hodgson and colleagues and Tim Besley and colleagues. In a nutshell, Besley tells us that the economists “lost sight of the bigger picture” while Hodgson blames a prefernce for mathematical technique over real-world substance. In Germany there has been some kind of Methodenstreit which is summarized in Carta. More details are on Rudi Bachmann’s homepage. For those who understand German, the plea for economic policy, as seperated from economic theory and more oriented towards the real world, signed by about onehundred German economists and published in FAZ (5. Mai 2009, Rettet die Wirtschaftspolitik). A comment on the FAZ-article appeared in Handelsblatt, and, as far as I know, there was a session about this at the annual meeting of the Verein fuer Socialpolitik. Last but not least, the activist magazine Adbusters launched an issue on Though Control in Economics, which is nice for bedtime reading but the criticisms (for example the neglect of environmental degradation) are, I think, familiar to economists. Nature of the crisis: How was the misallocation of research efforts possible? How can so many smart economists fail to come up with models that can explain the current crisis? I think this is a question that can only be answered by looking at the sociology of the profession. Implications for teaching: How will the economics curriculum change? Are we going to to give our students a copy of Keynes’ General Theory or are we continuing to teach economics as applied mathematics? Implications for economics: How far does the current situation challenge the core of mainstream economics? Is this just a temporary crisis for economic theory that will go away after a while, or is it the beginning of a larger shift in how we think about economics? It will take a few years to find the answer to the third question but questions #1 and #2 should be discussed and I hope that I can find some time to think about them more deeply.